FRENCH LICK, Ind. 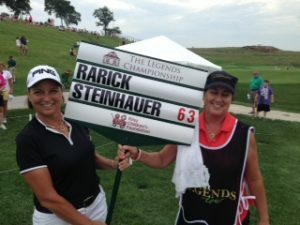 – Sherri Steinhauer posted a round for the ages on the LPGA Legends Tour Saturday, but – as good as her 9-under-par 63 was – it wasn’t good enough to give her the lead going into Sunday’s final round of the $500,000 Legends Championship, played on the tricky Pete Dye Course at French Lick Resort. Sherri Steinhauer (left) celebrates her 9-under-par round with caddie Lisa DePaulo. Steinhauer, who posted a 75 in Friday’s first round, made bogey on her first hole Saturday, then reeled off 10 birdies in the last 17 holes for what’s believed to be the lowest round in the 14-year history of the Legends circuit. It’s also the lowest round – male or female – shot in competition on the Dye Course. Legends’ officials believe the previous low was 65 by Lorie Kane in the 2011 Wendy’s Charity Challenge in Michigan but they wanted to check further before declaring Steinhauer’s round the best in the history of the circuit. It was a career-best for Steinhauer, who shot 64 four times while playing on the LPGA Tour. All those birdies on Saturday boosted Steinhauer, 51 years old and from Madison, Wis., to 6-under 138 total for the first 36 holes. That left her one stroke behind Laurie Rinker, who posted her 6-under 66 about an hour after Steinhauer finished. They’ll be paired in the final group for Sunday’s final round. Their closest challenger after 36 holes was Rosie Jones, the co-leader after Round 1. She shot 71 Saturday and is at 4-under 140 heading into the final 18, with a $60,000 first-place prize is on the line. The other first-round leader, Lisa Grimes, is a stroke behind Jones and the only other players under par are Barb Mucha (2-under 142) and Trish Johnson (1-under 143). Steinhauer wasn’t thinking along those lines Saturday. She was made after her bogey at No. 1, then went along for the ride the rest of the way. Enjoying it was no problem. She answered the first-hole bogey with a 20-foot birdie putt at No. 2, the made birdies from five feet at the fourth, eight feet at the fifth, one foot after a fine chip at the seventh and eight feet at the ninth. The back side started with birdie putts of 15 feet at No. 10 and four feet at No. 11, but the highlight of the day came two holes later when Steinhauer put a 4-iron second shot from 176 yards to six inches of the cup. She finished her birdie run with a 10-footer at the 14th and a long double-breaker at the 17th. As it turned out, the 10-foot downhill birdie putt that she left short at No. 18 cost her a share of the 36-hole lead. Using local caddie Caleb Powers for the second straight year, Rinker started Round 2 four strokes better than Steinhauer and was steady throughout. She hit 17 greens in regulation and putted from 60 feet for eagle from the fringe at No. 18. She took three to get in, however, so her lead remained at only one stroke. “Anything can happen tomorrow,’’ said Steinhauer, who won eight times –twice in major championships, on the LPGA Tour before winning her first Legends tournament at Innisbrook in Florida in 2012. Her only other Legends win came in last year’s Wendy’s Charity Challenge in Michigan, but Jones kept her from defending her title in that 18-hole event last Sunday. She’s downplaying the significance of winning the Legends’ biggest tournament for another reason, too. Both Steinhauer and her caddie, Lisa DePaulo, have been touched by cancer issues that diminish the significance of what happens to them on the course. Saturday’s play also included the start of the six-player Super Seniors division for players 63 and over. Jane Blalock, CEO of the Legends Tour and winner of last year’s Super Seniors, is tied for the leader with Judy Dickinson and Shelley Hamlin. All shot 77s on Saturday.